Bread really can be a healthy addition to your daily menu, it just depends what’s in it! 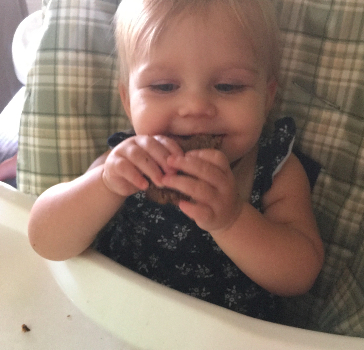 It can also be a good way to sneak in some extra fiber, protein and healthy fats into your littles without them even knowing. One of the best ways to do this: banana bread. The sweetness from the bananas makes it a favorite for all, although the touch of maple syrup doesn’t hurt either ;). Plus, you don’t need to add yeast to the dough, or even kneed it for that matter, so it really doesn’t get much simpler. 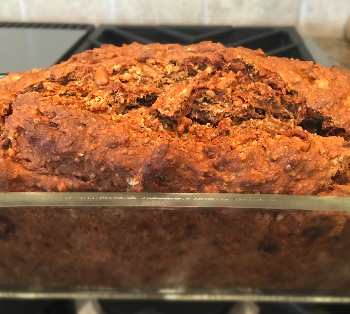 Flax, Chia and Sunflower Seeds are the additions that help give this bread such a wonderful taste and texture – plus that addition of healthy fats, protein and fiber I mentioned above. However, feel free to substitute more of one for the other. Just be sure to note that sunflower seeds don’t “plump up” like flax and chia do, so you will have to reduce your liquid amount in order to keep your dough from becoming too soggy. You can also add a variety of other nuts and/or dried fruit (cranberries and raisins are my favorites), making this bread as versatile as your imagination. 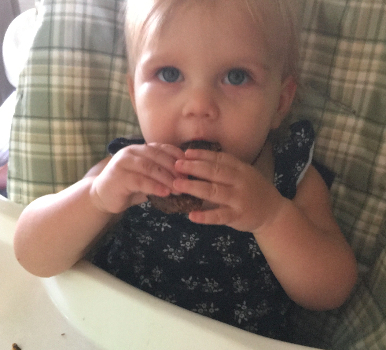 Now, just plop a slice in the toaster, slather with coconut oil, and both you and your littles have a snack that is not only good-for-you, but tastes deceptively unhealthy – and has even become the “treat of choice” for my toddler and 1 year old - as pictured below :). 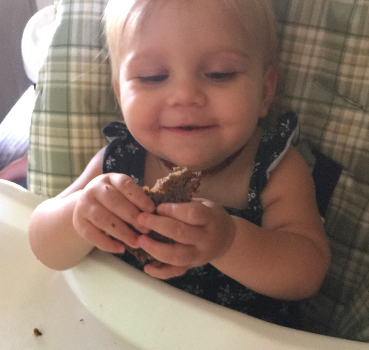 Baby Kenzley enjoying a slice. Time to Prepare: 10 min. Time to Cook: 50-60 min. In a large bowl, combine the dry ingredients: gluten-free flour, baking soda, baking powder, salt, Super Powder, chia seeds and flaxseed). In a small bowl, combine 1 tbsp. ground flaxseed with 3 tbsp. of water (to make a “flax egg”), and lightly beat. Or, use 1 Organic Egg. Add the soymilk, syrup, applesauce, and vanilla to the “egg” mixture, and whisk until combined. Pour the wet ingredients into the dry ingredients and stir until completely incorporated. Fold in the bananas and sunflower seeds. Pour the batter into a lightly greased bread pan. Bake for 30 minutes. Cover bread with foil (to prevent over browning) and bake for an additional 20 minutes, or until an inserted toothpick comes out clean.